Early-stage developments are attracting investment and driving dealmaking within the challenging neuroscience field, particularly for pain and Alzheimer’s disease, as the industry aims to move past the many late-stage clinical failures in recent years. Neuroscience remains a buoyant area for dealmaking, despite low drug development success rates and several expensive late-stage clinical failures. These challenges have changed the field of stake­holders over the last decade through a series of well-publicized withdrawals and a cluster of new entrants. Neurology, particularly conditions with a high societal and monetary burden such as pain and Alzheimer’s disease, attracts the majority of neuroscience invest­ment even though psychiatric disorders remain poorly controlled in many patients. Recent collaborations between pharma and medical device companies offer hope of a better understanding of these dis­eases through continuous monitoring and digital biomarkers. Other technologies have the potential to make biologic therapies more accessible to the CNS and, although at an early-stage, can command high deal values. While no other therapy area comes close to matching oncology in terms of deal volume (as we highlighted earlier this year; BioPharma Dealmakers B3–B6; March 2018), neuroscience is among the nearest contenders. The number of neuroscience-related licensing deals has increased consistently over the last decade, and although 2017 deals saw a decline in total projected value, 2018 could be a record-breaking year for investment with six deals valued in excess of $1 billion in the first six months of the year (Fig. 1a). The vast majority (~90%) of neuroscience deals have a primary neurological focus (Fig. 1b), a situation that mirrors the level of research and development (R&D) activity in the two disciplines. Assets with a broad neurological focus are the main driver of the increase in neuroscience deal activity in recent years. This is partly attributable to a general shift toward deals being signed at an earlier stage of development, which are frequently target-based and encompass more than one indication; 71% of the neuroscience deals from 2013–2017 were for assets before phase 2, compared with 66% of the deals from 2008–2012. Of the more specific indications pain (including migraine) and Alzheimer’s disease figure most prominently, which is understandable given the large population affected and the unmet needs. Deal activity in these areas has increased in the last five years, although relatively more dramatic increases are seen in rare disorders such as motor neuron disease, as well as cerebrovascular disease and brain injury. Pediatric psy­chiatric disorders, such as autism and Rett syndrome, have also seen an increase in deal activity in recent years, but there has been a noticeable drop in the number of deals for epilepsy and schizo­phrenia, even though neither condition is well controlled in all patients (Fig .1b). Fig. 1 | Trends in neuroscience dealmaking. Licensing, joint venture and research-only neuroscience deals by volume and value (a) and indication (b) from 2008 to 2017. The volume and value of deals in the first half of 2018 are also shown in part a, and the percentage changes in the number of deals between the two periods indicated are also shown in part b. The analysis includes licensing, joint venture and research deals with the therapeutic area categorization ‘neurological disease’ or ‘psychiatric disorder’ and an associated deal value. Only deals with a ‘primary’ focus are included in the analysis shown in part b, totalling1,012 deals over 10 years. See Box 1 for further details of the data. CNS, central nervous system; MDD, major depressive disorder; SMA, spinal muscular atrophy. Source: Cortellis Deals Intelligence. The strength of neurology dealmaking may seem surprising given the high-profile, late-stage clinical failures that have beset the area over the past two decades (particularly in cerebrovascular stroke and Alzheimer’s disease) and the comparatively low devel­opment success rates for the neuroscience therapy area overall, which has prompted several major pharmaceutical companies to withdraw or reduce their investment (Fig. 2). Johnson & Johnson is one of the few large pharma companies to have maintained a long-term commercial and research presence in the area, while Roche and Novartis have built substantial neuroscience R&D orga­nizations within the last decade, hoping to apply their success in oncology to this area. In addition, the sizeable neuroscience invest­ments in this period by Biogen, Takeda and new entrant Allergan suggest they have a higher risk tolerance than many major pharma companies or perhaps consider themselves contrarian investors. Fig. 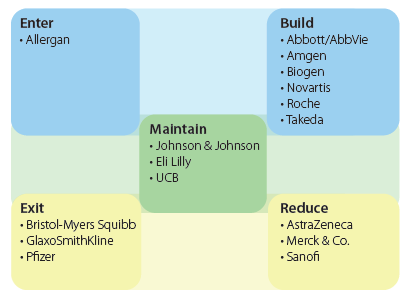 2 | Changes in major pharma companies with core neuroscience R&D. Companies are categorized according to the extent of their activities in the neuroscience area in 2018 compared with 2008. Wyeth, a major company active in the neuroscience area in 2008, was acquired by Pfizer in 2009. R&D, research and development. The level of venture capital (VC) funding and public offerings is another indicator of the interest in early-stage neuroscience. While such investments are susceptible to broader economic factors that produce a somewhat erratic picture when looked at year by year, the number and value of neurology-focused VC funding and public offer­ings have increased over the last decade, and neuroscience remained second only to oncology in terms of funding in 2017 (Fig. 3). When reviewing deal value, there have been 14 deals with a projected value of a billion dollars or more since 2013. 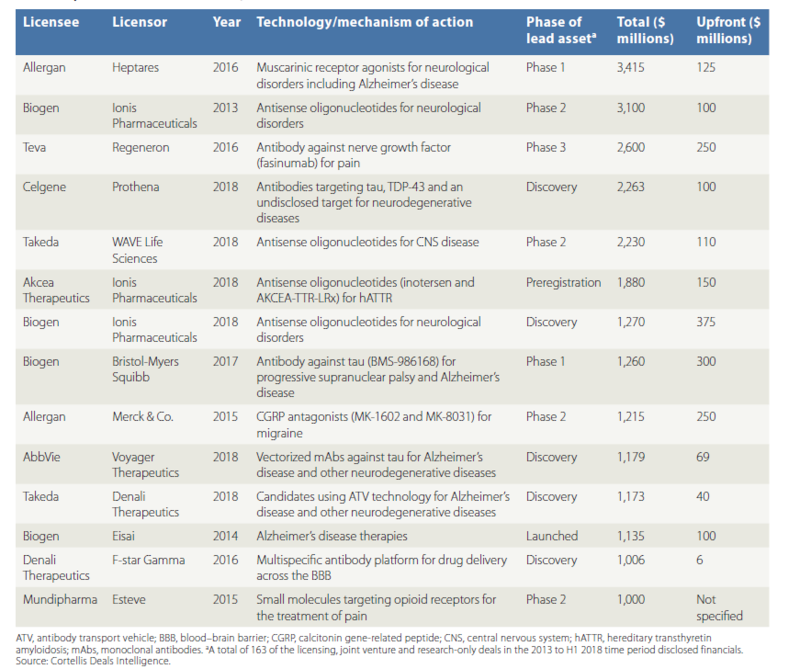 All these deals relate to neurological disorders, with pain and Alzheimer‘s disease featuring strongly, and 50% of them focus on early-stage assets (Table 1). Most of these deals involve biologics, specifically antisense oligonucleotides or antibodies and related delivery technologies. Fig. 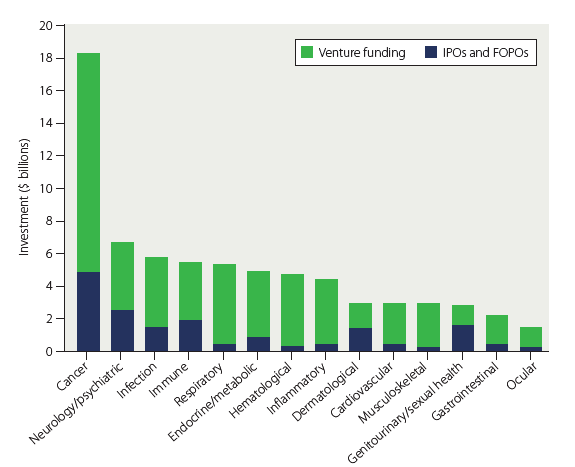 3 | Venture capital investment and public offerings in 2017 by therapeutic area. FOPO, follow-on public offering; IPO, initial public offering. Source: BioWorld’s BioPharma Financings Reports 2017. Biogen is the licensee behind four of these billion-dollar deals, and the company is also among the most prolific neuroscience dealmak­ers over the five-year period from 2013 to 2017 (Fig. 4). The company is a self-proclaimed believer in the potential within neuroscience. It is an established leader in multiple sclerosis, having a portfolio of approved therapies including beta-interferons and monoclonal antibodies such as Tysabri (natalizumab), and obtained approval for the first treatment for spinal muscular atrophy, Spinraza (nusinersen), in 2016. Despite the mounting failures with amyloid-focused approaches to Alzheimer’s disease, Biogen remains committed to R&D for the disease. Its lead candidate, aducanumab (an anti-amyloid antibody), is in phase 3 development, and cognitive improvements seen in a small, earlier trial have raised some expectations that this candidate might succeed where others have failed. The antibody was licensed in at the discovery phase from Neurimmune Therapeutics in 2007 for $380 million in upfront and potential milestone payments, as well as royalties on net sales. Biogen has since renegotiated the terms of this agreement to reduce its royalty obligations. Biogen expanded its Alzheimer’s disease portfolio through a 2014 collaboration with Eisai in which the company gained rights to two of Eisai’s assets in return for funding and options on Biogen pro­grams. The deal was amended in October 2017 to include Biogen’s aducanumab and to eliminate the milestone payments for Eisai’s Alzheimer’s drugs. In 2017, Biogen spread its Alzheimer’s bets by bringing in a phase 1 anti-tau antibody from Bristol-Myers Squibb for $300 million upfront and a total projected deal value of more than $1.2 billion. Biogen is also attempting to tackle cerebrovascular stroke, another area that has seen several late-stage disappointments in the past. In September 2018, Biogen enrolled the first patient in a phase 3 trial of intravenous glibenclamide for ischemic stroke. The asset was acquired from Remedy Pharmaceuticals in May 2017 for $120 million. In 2013, Biogen partnered on a deal with Ionis Pharmaceuticals that focused on antisense oligonucleotides for various neurological diseases. This deal led to the groundbreaking approval of Spinraza, which had sales of $883 million in 2017. The Ionis agreement was expanded in April 2018 with Biogen paying $1 billion in cash, to include $625 million in equity and a $375 million upfront payment. All neurological disease and psychiatric disorder business transactions with a deal start date between 1 January 2013 and 31 December 2017 were extracted from the Cortellis database. Deal “Transaction Type” for Acquisitions (100% or Majority Stake), Mergers, Reverse Mergers, Joint Ventures, Research-Only and the “License” subtypes of “Basic License”, “Co-Development”, “Co-Marketing, “Co-Promotion” and “Collaboration” were selected for analysis. Data for the first half of 2018 have also been included where possible. The resulting datasets were filtered to exclude non-therapeutic focused deals using the “Technologies” categorization. Deals where the primary focus were any of the following were excluded: Assays, Bioinformatics, Biomarkers, Diagnostic Methods, Drug Formulation, Drug Screening, Generics, Genomics Technologies, Imaging, Instruments, Lab Reagents, Manufacturing, Medical and other devices, Radiolabelling, Service agreements and Software. All “Pending” deals and “Terminated” Acquisition deals were also excluded. Dataset numbers vary for the different analyses according to data availability. Biogen is not the only company investing heavily in Alzheimer’s disease; Allergan and Takeda have also each executed large deals in recent years (Table 1). Allergan (formerly Actavis) is a comparatively new entrant to the neuroscience market, having amassed a port­folio of marketed and developmental agents via externalization to broaden its original Botox franchise. In addition to in-licensing, the company has made several significant company acquisitions aimed at securing phase 3-ready assets. Rapastinel, an N-methyl- D-aspartate modulator obtained through acquisition of Naurex, remains ‘on track’ for a late-stage clinical study in depression. However, CPC-201 (a combination of the approved anti-Alzheimer’s drugs donepezil and solifenacin), which came from the 2016 purchase of Chase Pharmaceuticals, has yet to start the single phase 3 registra­tion study that was planned for 2017 and the drug is not mentioned in Allergan’s most recent pipeline highlights. Large-scale neuroscience mergers and acquisitions (M&A) trans­actions (over $1 billon) were relatively infrequent in the five-year period from 2013 to 2017 (Table 2), and the outcome of such activity when in the absence of already commercialized assets was not always positive. For example, Valeant purchased Sprout Pharmaceuticals in 2015 for $1 billion to gain rights to the female libido drug, Addyi (flibanserin), only to sell the company back to its original shareholders two years later for a 6% royalty on the drug. In a break from this trend, the first half of 2018 has already witnessed two very large neuroscience-related M&A deals. In April this year, Novartis announced its acquisition of AveXis for $8.7 billion, the lead asset for which is a gene therapy for spinal muscular atrophy that will ultimately compete with Biogen’s Spinraza. However, this deal is dwarfed by Takeda’s $62 billion buyout of Shire, which incor­porates a strong neuroscience component. Shire’s neuroscience sales revenues in 2017 were $2.7 billion (18% of the company’s total sales) and were almost exclusively from products for atten­tion deficit hyperactivity disorder (ADHD). The company’s cur­rent neuroscience clinical pipeline has just two candidates: a phase 3 candidate, SHP615, for convulsive seizures, and a phase 1 candidate being investigated for potential in neurological condi­tions. Takeda’s main neuroscience product is the antidepressant Trintellix (vortioxetine), which is only marketed in the US and had sales of $435 million in the 2017 fiscal year. Takeda’s intent to further develop a presence in this therapy area is evidenced not only by the Shire acquisition, but also by its $2.2 billion col­laboration with Wave Life Sciences to work on antisense oligo­nucleotides for genetically defined neurological diseases that was announced earlier this year (Table 1). What next for the neuroscience area? In conclusion, neuroscience remains an impelling area for pharma­ceutical dealmaking. Alzheimer’s disease continues to attract a high level of investment, particularly regarding new biologic approaches such as antibody drug delivery systems and antisense oligonucleotides. Smaller-scale collaborations seeking to improve the diagnosis of neurological diseases such as Alzheimer’s disease, Parkinson’s disease and Huntington’s disease, including wearable devices to provide continuous real-time monitoring of disease progression, are emerging. While psychiatry has not seen the same level of inter­est as neurology, even here the results of collaborations such as the 2018 deal between Takeda and Mindstrong Health to identify digital biomarkers of various mental health problems offer the potential to improve understanding, and ultimately management, of such disorders. Neuroscience deal value has benefited from the push toward development of therapies for rare diseases, sparking the $8.7 billion acquisition of AveXis for a late-stage asset for spinal muscular atrophy, a disease that affects only 1 in 6,000 newborns. However, it is undoubtedly the enormous societal and economic burden posed by conditions such as Alzheimer’s disease and pain that will continue to drive investment in the area for many years to come. Jamie Munro and Helen Dowden are based in the Portfolio & Licensing team at Clarivate Analytics. From the publishers of Nature, BioPharma Dealmakers brings together life sciences companies and individuals looking to identify and attract partners and dealmaking opportunities. With a quarterly magazine that is distributed in Nature Biotechnology and Nature Reviews Drug Discovery, BioPharma Dealmakers provides insights into dealmaking trends and profiles from companies looking to partner – showcasing their pipeline products, technologies, therapeutic focus and partnering strategies. Our March 2019 edition is live. From the publishers of Nature, the BioPharma Dealmakers website brings together life sciences companies and individuals looking to identify and attract partners and dealmaking opportunities. It provides insights into dealmaking trends from BioPharma Dealmakers Editors, profiles from companies looking to partner, tools for networking and sharing knowledge, and the opportunity for sponsoring companies to showcase their expertise. BioPharma Dealmakers is THE destination for partnering professionals looking to make connections and get the latest on their industry.